Unfortunately, this one is in need of a lot of serious repair and setup work. Let's take a closer look at a guitar that shows almost the entire list of damage and symptoms of heat abuse. Lots of finish checking for a Martin! 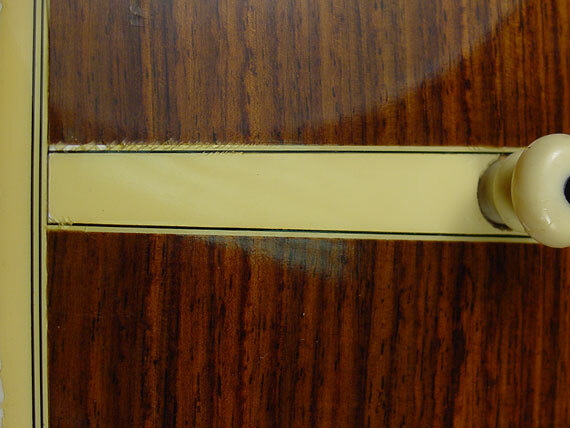 In contrast to Gibson, Guild and others, the finishers at Martin have always been careful to keep the lacquer film thickness at an optimum 6 mils to avoid finish checking. 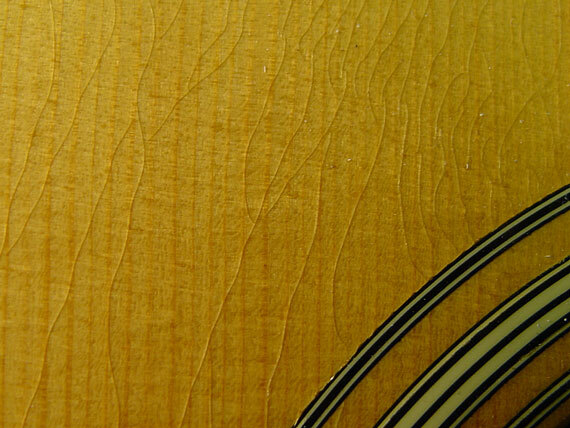 Over about 8 mil thickness, and lacquer tends to crack spontaneously. 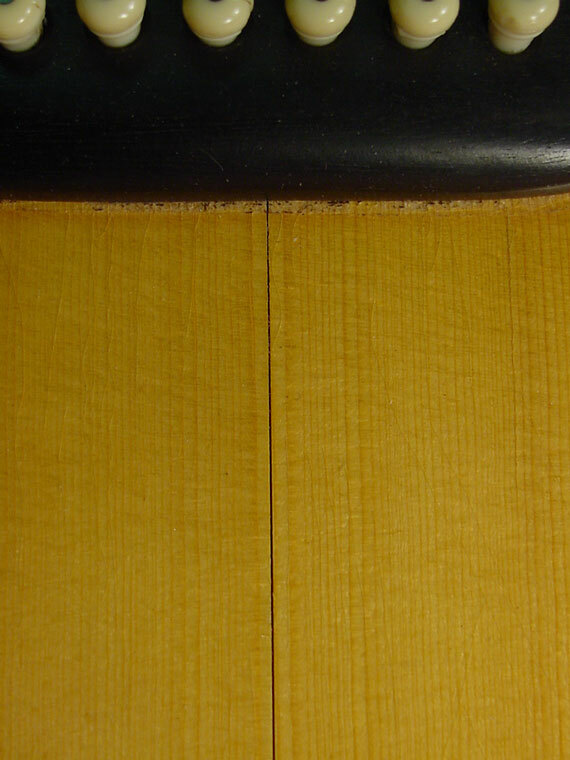 A Martin finish generally won't check like this unless it is exposed to rapid changes in temperature, particularly the cold. As a result, around here we call them "cold cracks" because our winter isn't cold enough to cause them on many Martins. So much for cold. The rest of the syndrome is a result of excess heat. Look at this loose bridge. While it is still (sort of) adhering to the top, it has obviously slid forward about 1/8" inch. The ONLY way this can happen is for the glue to become semi-liquid in excess heat. Around these parts, that usually means a car parked in the hot sun. No choice but to take the bridge off and reglue it. Oh-oh! I guess we'll have to replace the bridge while we're at it. 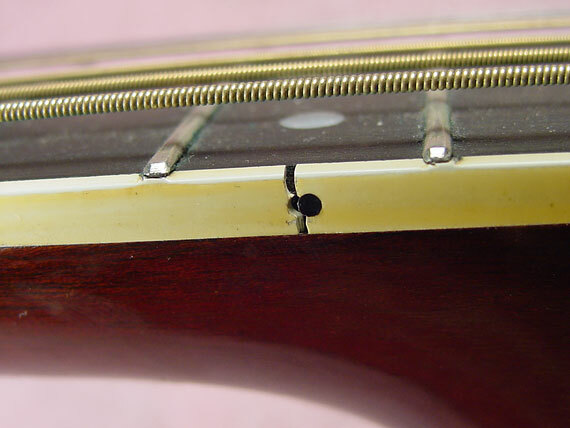 The cracks through the pin holes can be a direct result of heat causing dryness and shrinkage, but more commonly they occur when the bridge, top, and bridge plate bend upward with string tension after the glue is softened in heat. Even though it's pretty thick, the ebony can't resist cracking with this kind of direct pull right in the center where the holes are drilled. Plastic parts shrink like crazy as their volatile components are driven out in high heat. The bottom margin of the pickguard resolved this issue by tearing loose and curling up like a potato chip. The inboard edge of the pickguard went a different route, staying firmly glued to the top, and simply ripping a hole in the spruce. No surface check, this. Even the top has been curled up out of alignment along with the shrinking pickguard. Looks like it's time to reglue or replace the guard and get inside for some crack repair. When it dries, say, in high heat, wood shrinks. It shrinks only widthwise, across the grain, not in length. Here, the top took advantage of the heat weakened glue to open the top joint nice and wide! 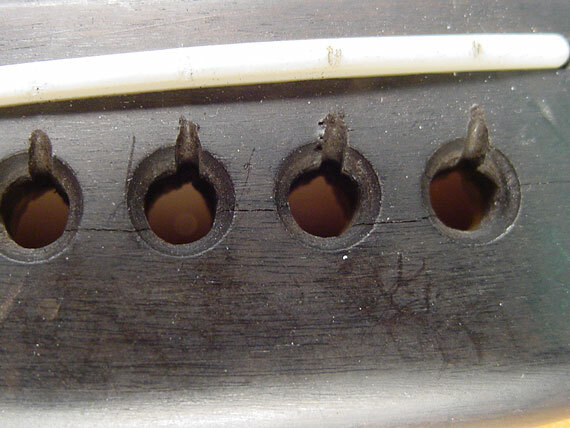 Too bad that returning the guitar to normal humidify won't close the crack. If it's severe enough, some of this this cross grain shrinkage is permanent. 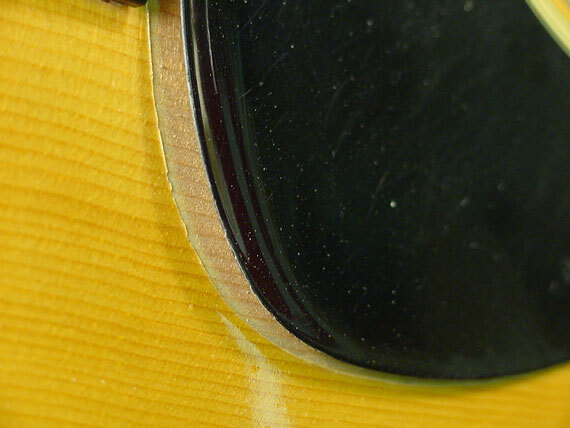 More crack repair, and a bit of filling from the top in the form of a dark line of glue or a spruce inlay. Nasty business. We're not through with the top yet. 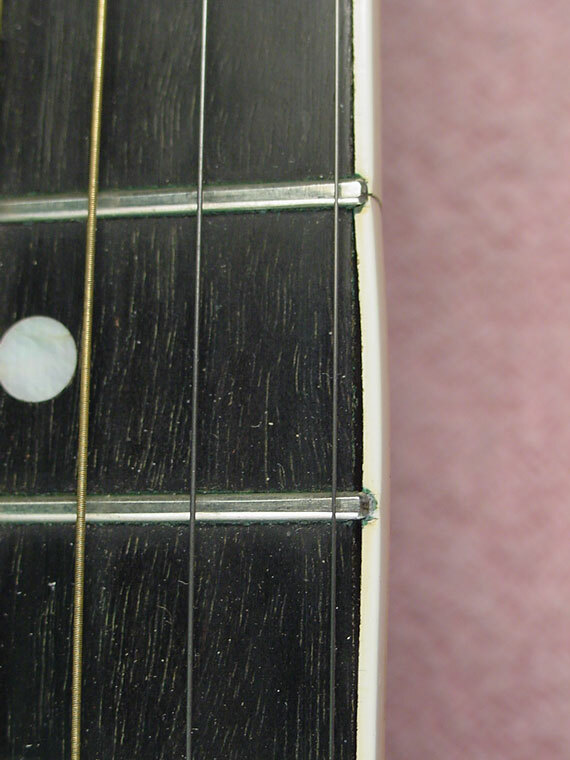 This tiny crack at the edge of the fingerboard is potentially the most serious of all, because in this area the top carries a lot of the load of the forward pull on the neck by six tight steel strings. If you look really closely you can see that the center area has actually slid forward a tiny bit. 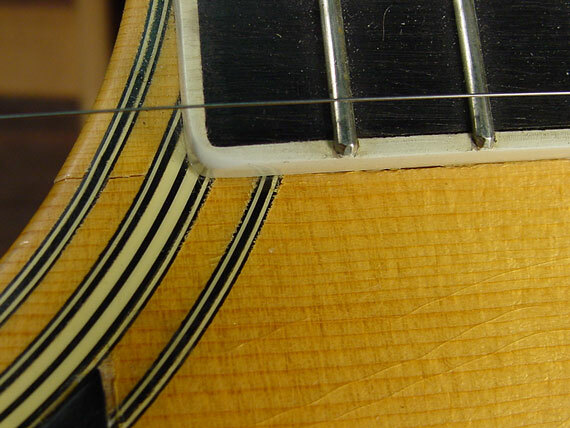 In order to do that, the glue had to be weakened under the two braces between the soundhole and neck block. Heat again. Time for regluing braces realigning the top, reinforcing the remaining areas underneath. 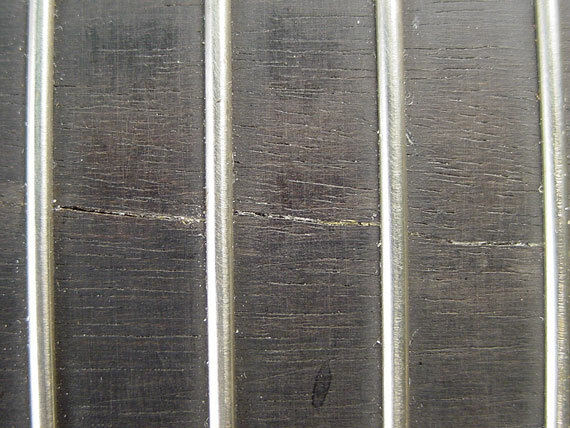 The fingerboard cracked, too. Same cause -- wood shrinking across the grain, being held down tightly at the glue joint underneath. The good news is that this crack is hardly ever structurally significant, and can be fixed quite easily by filling it with black compound. 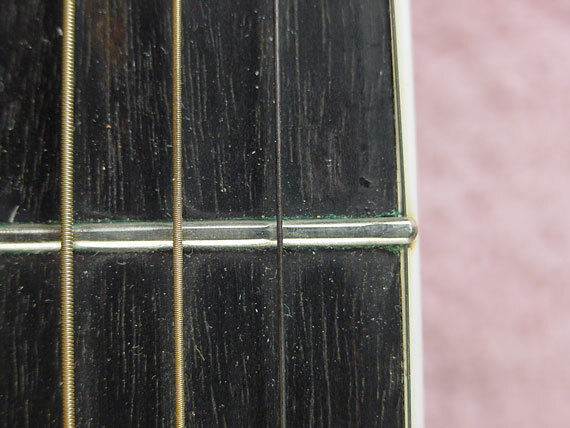 More evidence of fingerboard shrinkage -- the fret ends are sticking out, and frets didn't get longer with age. The cure? 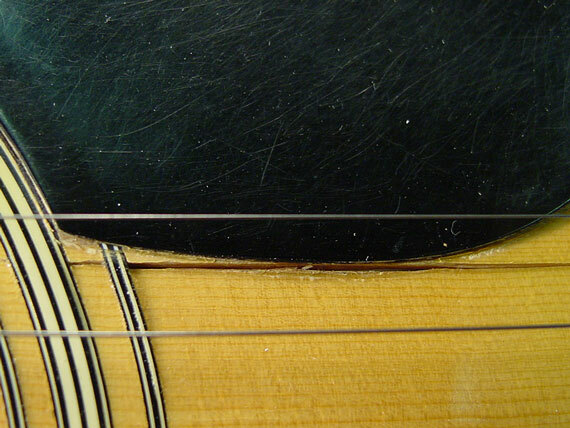 Remove all the frets and replace them. The fingerboard won't be growing wider. All along the neck, the binding is literally falling off, again having shrunk by "drying" in the heat. In some places, the binding resolved its tension by breaking. Down at the heel, check out this little gap. The glue in the dovetail joint became so soft that the neck actually pulled partially loose in its joint. No question whether this one needs to be reset. So, we're into steaming the neck joint, extracting it, recutting the joint, resetting the neck. Not a unusual operation on a 25 year old guitar, but a Martin with a LOOSE neck, well, that usually takes a lot of hot car exposure. Even the little end wedge inlay is falling out from shrinkage. If it weren't for that bright glint at the bottom edge of the pickguard, I could just about use this same photo as an "after" shot! I hadn't intended this as a repair article because I've covered most of these jobs in previous articles, but I couldn't resist this series of photos showing so many of the effects of heat all in one example. What surprises me is that one of the most common bits of plastic shrinkage was not evident at all. Certainly the heat caused the body binding to loose plasticizers, and you can bet that it's under a fair bit of tension. It isn't loose anywhere around the top or back - a piece of good luck, for now. 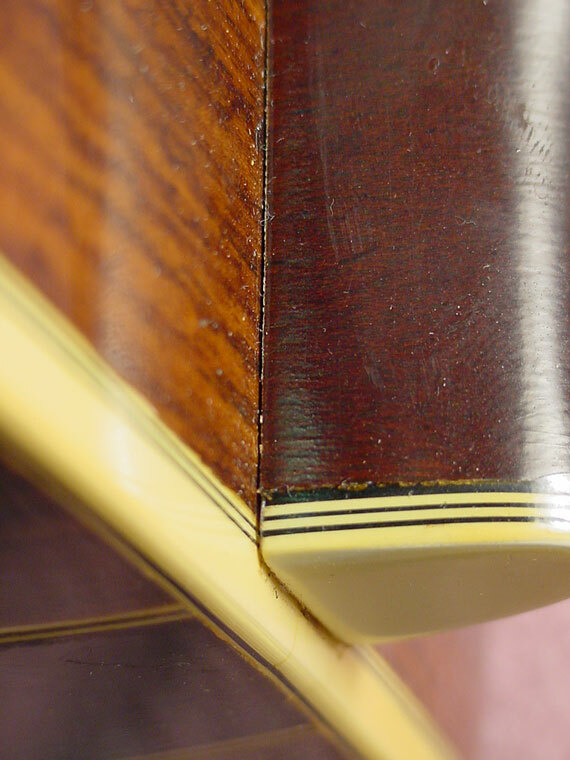 Also, there were no shrinkage cracks in the rosewood back, another common area for heat damage to show up. 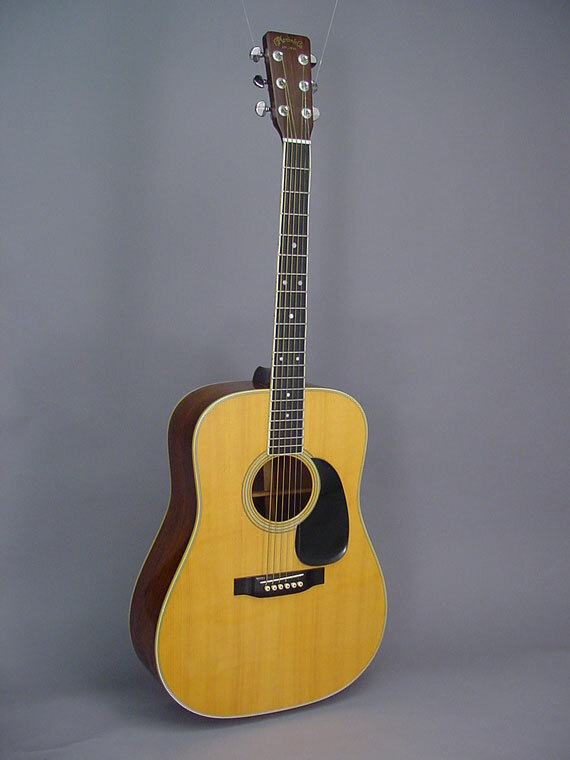 As of now, this D-35 is once again solid and doing well, with few outward signs of damage. Really, the only serious damage was to its owner's wallet. It cost him just about the full replacement value of the guitar to get it back on the road. A price he said he was glad to pay to get his old friend back in shape. Good fellow!